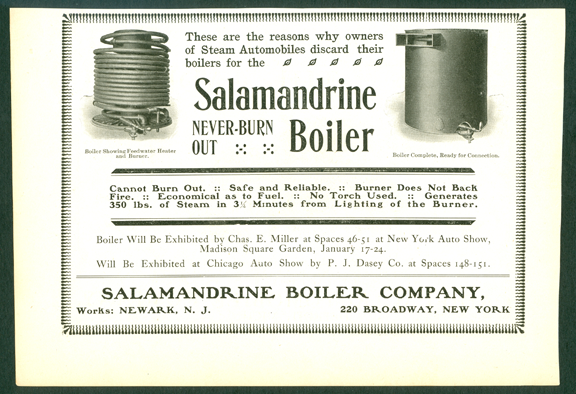 The Salamandrine Boiler Company offered a replacement water tube boiler for Locomobile and Mobile steam cars, describing its product as the NEVER BURN OUT boiler. The Salamandrine Boiler Company placed this advertisement in Motor Age on January 15, 1903. Floyd Clymer reproduced this advertisement in his steam car scrap book on page 61. Contact us if you have additional information about the Salamandrine Boiler Company, or if you have questions. Thank you for your financial support.